This is where it gets fun. At our last meeting, Hunter and Damon were ready to show us the first 3D renderings of the tiny house. At this point we need to decide: What is this thing going to look like? What shape will it be? How can we maximize the space all around, but still give it some personality? If maximizing space all around were the only goal, we would most likely end up with a really cool looking box. We also considered various sloped roofs. It would be especially nice to still incorporate the gable of a typical home and nod to the original Cinder Box dwelling. 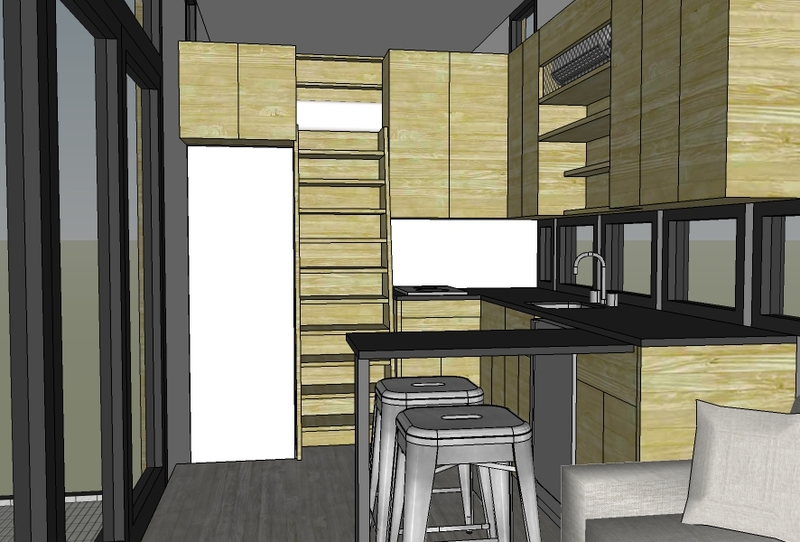 To do so, we could maximize the ceiling height on the end with the bathroom and sleeping loft, but still have some room to play height-wise with the main kitchen and living room area. We love how Hunter and Damon decided to blend the two. Below is a diagram displaying the process. Someday, we could have a whole community of Mobile Cinder Boxes, each with their own personality! Here are some pics of the outside. Deck is just an approximation, actual design to be customized for our backyard. Main kitchen area with doorway to bathroom/laundry open showing sightline through window on end. AC/heat unit built into vented cabinetry above the sink. Slide out peninsula extended; bathroom pocket door closed. Ladder will include extended railings starting at cabinet height. 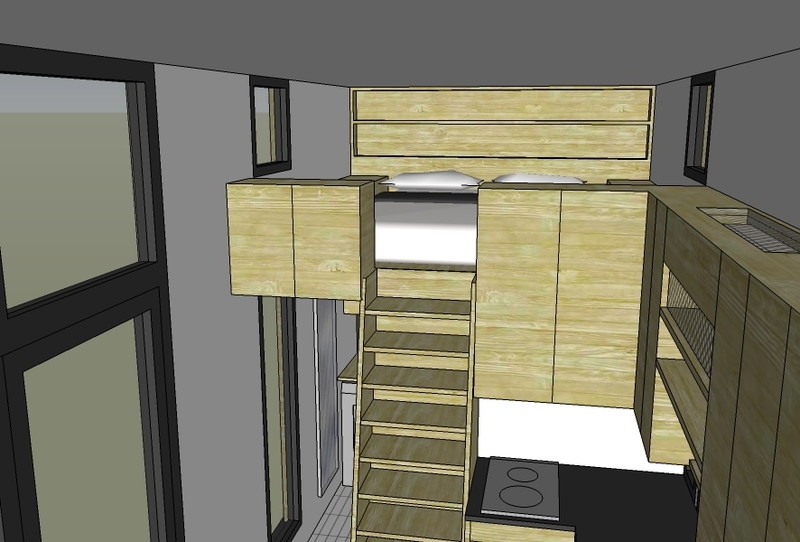 View into lofted bedroom area. Operable windows on either side for ventilation. Built-in bookshelf headboard to feature built-in plugs, USB ports, reading lamps, and lipped edge for reading material. View from bedroom, storage "benches" on either side of bed, with enough clearance on either side for bedding. 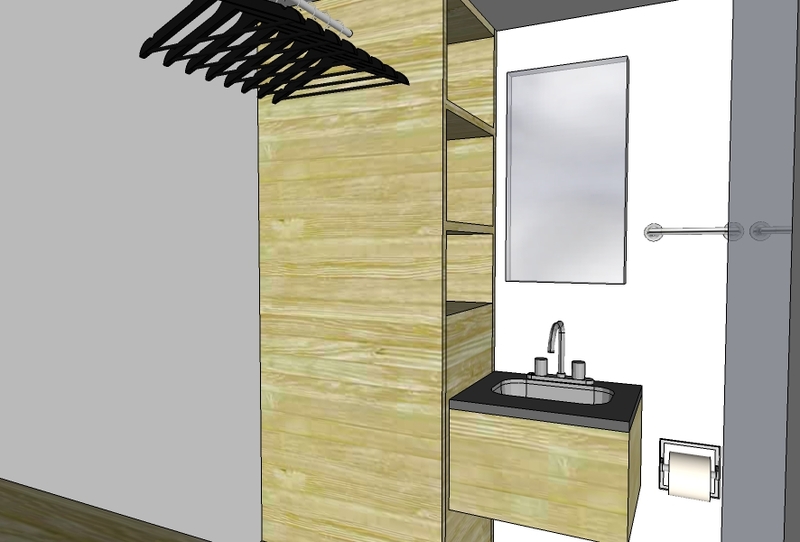 Bathroom with built-in shelving and hanging space. Will feature access panel for tankless water heater. 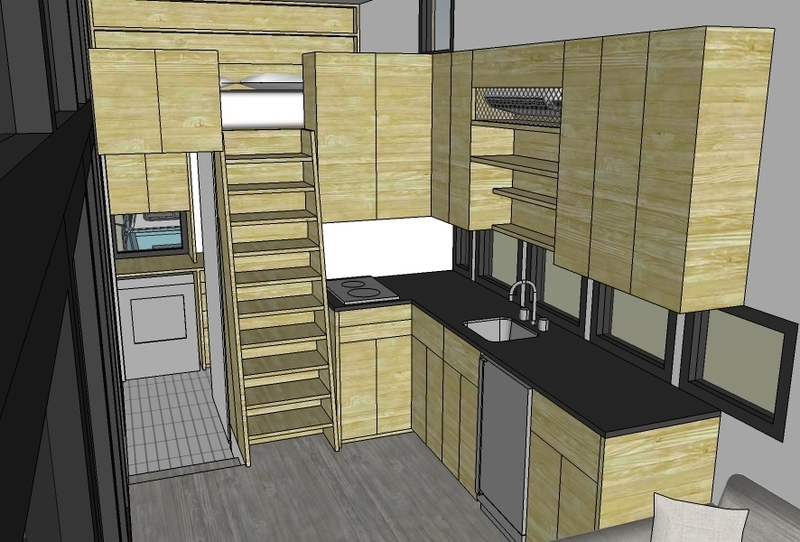 Closet with laundry counter and additional storage. 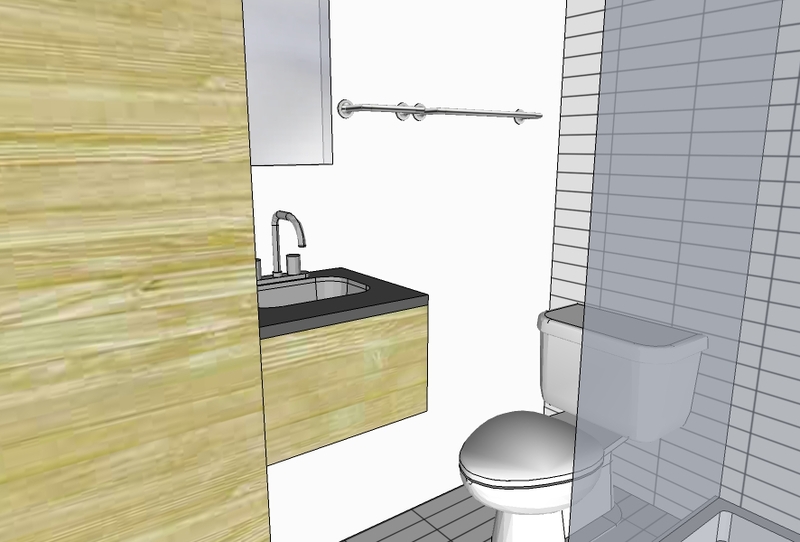 Toilet area and shower. To include a rounded shower curtain track for maximum space when not in use. We also discussed a lot of details to be tweaked. No shower glass, use corner curtain and rail. Consider adding second floor drain. Windows at loft to both be operable. Use different sofabed instead of Ikea Frieheten (83" wide). Look for pop-up coffee table. Widen entry door to 3'-0". Add handrail to either side of stair/ladder, start at 4'-6". Continue to side walls for barrier. Narrow custom size trash/recycle to save space. Larger kitchen sink, farmhouse front for extra depth. Adjust windows at kitchen to have centered eye level at sink (operable if possible), backsplash for magnetized storage. Add microwave/oven, probably over stove. Pre-wire for electric shade system (to be added in future, budget allowing). 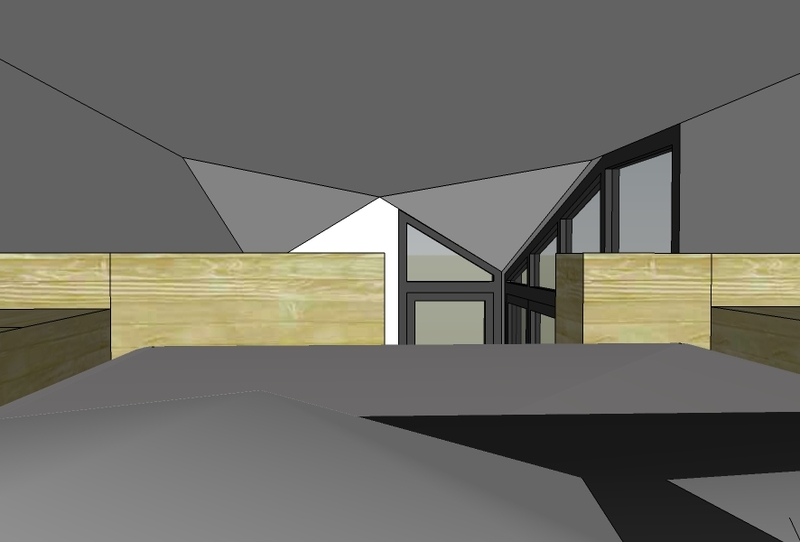 Valance and roller shade could be added to the multi-slide doors facing south. 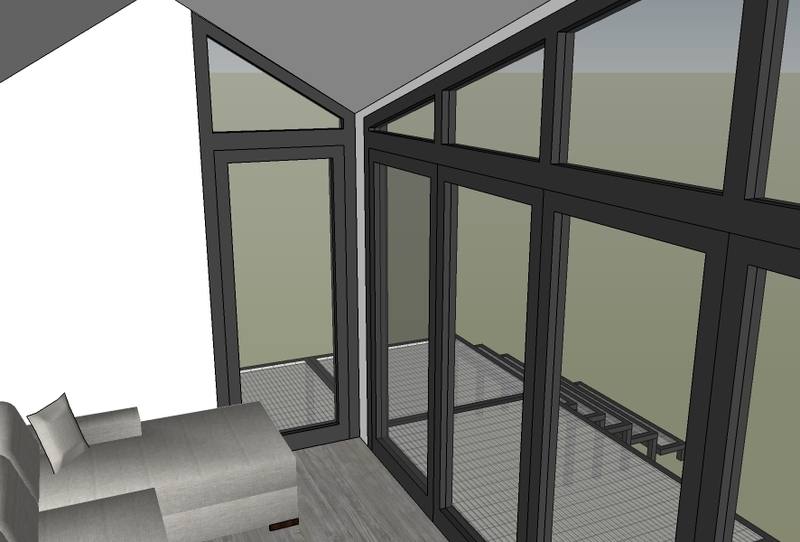 Team discussed other options including built in shear shades, tinting, and trees. Hunter and Damon have now presented the design to the builder, MAK Construction. They will be assessing the feasibility of the design according to the budget and identifying some areas to approach for value engineering (i.e. creatively cutting costs). We have been warned that, as in any project, there may be some concessions between the "wishlist" of the design and the workable budget. The team has been hard at work procuring the numbers and looking into cutting edge materials and finishes that are light weight, easy to clean, and durable. They are getting estimates and samples from all the necessary suppliers so that we will have a range of appropriate material finishes to choose from at our next meeting. We're pretty excited about that part. What do you think? What features do you like, and what could we be missing? As an Airbnb guest, or a tiny-house dweller, are there any features or amenities that would be especially important to you? Let us know in the comments!